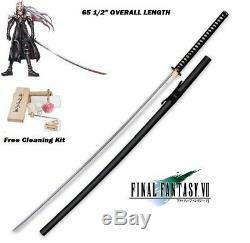 Sephiroth Giant Masamune Sword - 65 1/2 Length. 49 fully sharpened steel blade. Traditional cotton cord and faux ray skin tsuka. This Masamune sword is the ultimate weapon for Final Fantasy collectors. At 65 1/2 in overall length, it's probably the biggest sword you'll ever see! When someone walks into your house and sees this giant hanging on the wall, they'll know you are a TRUE Final Fantasy collector! This unique sword offers a 49 fully sharpened steel blade and a traditional cotton cord and faux ray skin tsuka that is double pegged. The tsuba is cast with an ornate, oriental dragon reminiscent of early samurai art. Each sword includes a lacquered wooden scabbard for storing your new favorite sword. This sword looks amazing, it made a great gift and was very much appreciated! Please consider visiting our Store if you like our items! We are not responsible for undeliverable addresses. If you are purchasing this item outside the US, you should be aware of the program's policies. We will always work to resolve any problems or issues. We appreciate your business very much. The item "Full Size Hand Sharpened Sephiroth Masamune Katana Final Fantasy 7 VII Replica" is in sale since Wednesday, October 3, 2018. 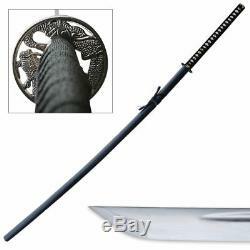 This item is in the category "Collectibles\Knives, Swords & Blades\TV, Film & Game Replica Blades". The seller is "modern_markets" and is located in Continental. This item can be shipped to United States, Canada, Australia, Taiwan, Thailand, Hong Kong, Mexico, Philippines, Norway, Qatar, Kuwait, Bahrain, Bahamas, Viet nam, Uruguay, Turks and caicos islands, Bermuda, Bolivia, Egypt, Iceland, Jordan, Sri lanka, Luxembourg, Maldives, Oman, Peru, Pakistan, Paraguay.